Dr. Guruswamy Mudaliar was a famous physician from Madras, India who was highly regarded for his diagnostic skills and success in curing patients. He practised at a time when physicians used their stethoscopes and percussion techniques to diagnose ailments rather than x-rays and a battery of tests! He was born in 1880 in a village called Nelamangala, near Bangalore. His father was a building contractor working for the British Government in India. The village had no school and Guruswamy had to walk several miles every day to the adjacent town to attend school. He lost his father at a very early age when he was still in school. It is believed that he was washed away by a current while building a bridge across a river. After this life became extremely difficult as the family had no regular income. At school he used to starve during lunch time and often drank water from a tap to relieve his hunger. His mother, along with her sister, who also had a son by the same father, somehow managed to support the family. Seeing the family suffer gave him the determination to complete his education and ensure that his mother, aunt and brother would be able to lead a better life in the years to come. He excelled in his school and college exams and graduated in 1902, from the Central College in Bangalore, with a first class degree in BA. He was also a classmate of Mr. C. Rajagopalachari, a leading lawyer turned politician, who held many high offices in India, including that of the last Governor General. After gaining his BA degree, he joined the Madras Medical College, on a scholarship sponsored by the Government of Mysore. He was an outstanding student and graduated from the college winning the Chipperfield Gold Medal for surgery. 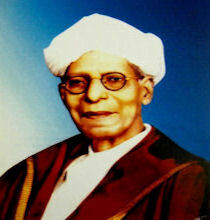 In 1920 he took the doctorate in medicine from the University of Madras, when the degree was first introduced. In 1957 the University of Madras awarded him the D.Sc. for his significant contribution to medicine. Guruswamy Mudaliar had a varied and interesting medical career. In 1909 he worked for the Mysore Government as Officer-in-Charge of the anti-plague campaign. He joined the Madras Medical Service in 1910, standing first in the competitive examination for recruitment, and served the state until his retirement in 1937. He was first posted to Dehra Dun to specialise in radiology. He later served as a lecturer in anatomy at the Medical School in Tanjore where he taught anatomy. He also taught physiology, ophthalmology, surgery and midwifery! In 1915 he was transferred to Madras as Assistant to the reputed physician, Col. Elwis. He was appointed Professor of Materia Medica in 1920, the first Indian to occupy that chair. In 1927 a chair in therapeutics was created for him. In 1929 he was deputed to England to study the teaching of therapeutics. When he reached England he found the standards and the practice of medicine there to be no different to what they were in Madras. He therefore informed the government that he was unlikely to gain much by staying there any longer and it was best he returned soon without wasting public funds. The government accepted this and he returned to India shortly after that. He was a distinguished physician with intuitive powers of diagnosis. It is said that he had an acute sense of smell that he could smell typhoid. He would walk in to a ward and ask if they had admitted a patient with typhoid. He was highly regarded by his peers and patients. His students considered him an excellent bedside teacher. He gave them the freedom to challenge him on his methods of examination and treatment. He combined a spiritual outlook with his clinical knowledge. He was held in such high regard that he was consulted by the elite in government. Although he was educated and trained through the allopathic system of medicine he often thought that the indigenous medicine had a lot to offer and needed much research. After his retirement from Government service he was appointed as Honorary Director of Indigenous System of Medicine and held the post until June 1955. During his tenure, the School of Indigenous Medicine in Madras attained the status of a college and a degree course was initiated. A man of few words, he expressed his views in a soft voice and was brief and to the point. He was pious and observed a strict daily routine including a Day of Silence on Fridays. He was an early riser, getting up before 5 a.m. every morning. After a shower and a prayer lasting 30 minutes, he would personally open his consulting room often before 6 a.m. to receive his patients. The rich and poor consulted him at the same clinic at the same time. Anyone could walk in to see him between 6 and 8 AM and between 4 and 5 PM. He knew how difficult it was for the poorer patients to pay a fee. He therefore did not ask anyone to pay. However patients would leave whatever they could afford on his table. He never knew how much was left on the table as the money was dropped into a box. It is said that on one occasion when a patient arrived in a rickshaw to see him, he not only saw this patient but also the rickshaw puller who wanted to consult him. After his morning clinic he would attend hospital and return home only at 2 or 3 p.m. for a late lunch. After lunch he would check his mail and go through his British Medical Journal. He would then consult again between 4 and 5 p.m. followed by evening prayers and early dinner at 7 p.m. He would read the evening newspaper before retiring to bed by 9 pm. This practice continued long into his retirement until ill health prevented him from seeing patients in the end. Dr.Guruswamy mudaliar took a leading role in the formation of The Association of Physicians of India in 1944 and served as its first President. The Association which was formed in Madras was later shifted to Bombay. He was connected to the Medical Council of Madras for a lengthy period of time. He was well known in the city of Madras and held other distinguished positions. He was a Director of the Indian Bank, one of the leading banks in India. He served as a member of the Senate and Syndicate of the University of Madras. He was nominated as a member of the Legislative Council, the upper house of the Government of Madras. As President of TTV High School he was a major benefactor contributing land and significant funds to develop the school. Having gone hungry as a student in school he made sure that the poor students of his school were provided with free meals during lunch time. He also introduced a programme for the improvement of educational standards of the students. As President of the Temple Renovation Committee he was responsible for the improvement of the physical fabric of many temples in the region. He was a deeply religious man and well versed in the ancient Indian language of Sanskrit. As a philanthropist he supported many causes. His significant career progress and his lifetime achievements, despite so many challenges, have been an inspiration to many people. He died in 1958 at the age of 78 leaving two sons, four daughters and many grandchildren. To this day many an old patient of his continues to sing his praise. Examples of ‘miraculous’ cures based on his intuitive diagnoses abound in and around the city of Madras. The citizens of Madras have marked their high regard and love for this outstanding physician in many ways. His statue stands at the entrance to the Madras Medical College and his name is borne by the road where he lived. A key road bridge in the city and a block in one of the hospitals where he had worked are also named after him. His philanthropy continues to enable poor students to have access to education and employment to this day. This article is partly extracted from “The Wall of Honour” page at The Royal Society of Medicine, London.